You may recycle your Christmas tree beginning on Monday, December 28th. Residents should drop off their trees in the Agnes Scott College parking lot between 184 and 206 S. Candler Street. The drop off period runs from December 28, 2015 through Saturday, January 9, 2016. Please do not leave trees anywhere else on the Agnes Scott campus. Just a quick reminder that Monday, Sept. 1 is the Labor Day holiday. All city buildings will be closed and there will be no solid waste or recycling pick up. Instead, Monday’s solid waste and recycling collection route will be serviced on Tuesday and Tuesday’s collection route will be serviced on Wednesday. Have a safe and fun three day weekend! Memorial Day is Monday, May 26. As a result, Monday trash and recycling pick up will be on Tuesday, May 27. Tuesday trash and recycling pick up will be on Wednesday, May 28. Due to the weather, residential recycling pick up was suspended before today’s routes could be completed. If your recycling is normally picked up on Tuesday but was not picked up today, it will be picked up later this week. Please continue to check back here for updates on trash and recycling pick up. You should have received a copy of the Holiday Sanitation Schedule on your door last weekend. Regular trash and recycling services for Thursday, Nov. 28 (Thanksgiving) and Friday, Nov. 29 (Black Friday) will be on Wednesday, Nov. 27 (tomorrow, the day before Thanksgiving). Here at the City of Decatur we wish you a safe and happy Thanksgiving and hope that you’re in town for Small Business Saturday. 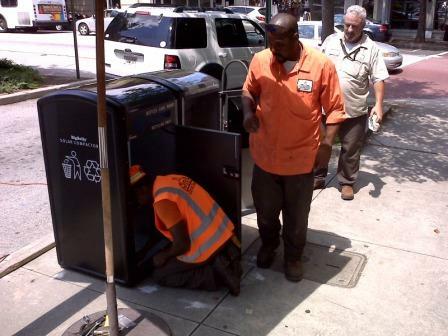 We are so excited that Decatur is among the first around to install solar powered trash compactors! 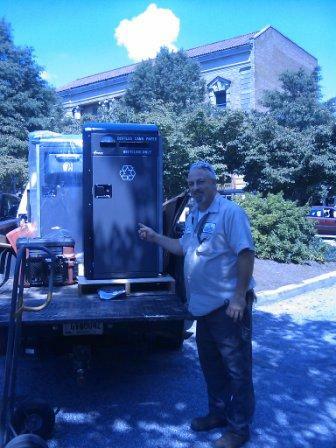 The compactors are being installed in front of Starbuck’s and Java Monkey as we speak. Jerry Knotts and his crew are working hard to get them going and I can’t wait to see them in action. Jerry Knotts shows off the new compactors. New and more visible recycling bins are being installed as well, but they won’t compact. Hopefully these additions will be a big hit and we will see them popping up around the city soon. 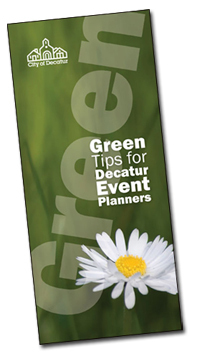 The former Waste Managment Advisory Board, working with the Public Works Director and the Special Events Coordinator, has produced a guide for “greening” events, block parties and other gatherings in the city of Decatur. The brochure is available for downloading at www.decaturga.com or at Decatur City Hall. The Guide offers many tips for planning a special event beginning with selecting the location, planning purchases to minimize waste on the front end, planning for recycling and food waste and more. The guide also encourages planners to educate the attendees on protecting the environment. The Decatur Business Association has already jumped on the “green” wagon. Food vendors at the June Beach Party will be required to use biodegradable paper goods as well as recycle plastic, glass and cardboard. The Public Works Department will also be on hand to distribute information on the City’s recycling plan and give out tattoos with the recycling logo. As you may know, all city sponsored events currently include both trash cans and recycling containers for plastic, metal and glass. We hope to encourage all event planners, both large and small, to recycle and produce greener events.